Several unusual trains have operated on Big Sandy. 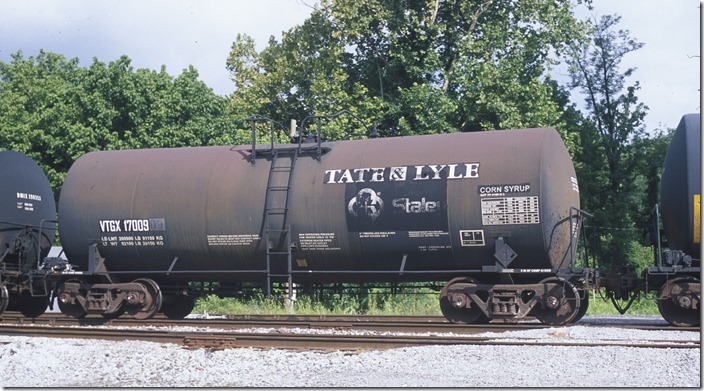 These being tank car trains of corn syrup, molten sulfur and anhydrous ammonia. I haven’t seen those trains since, but that doesn’t mean that they haven’t passed through. 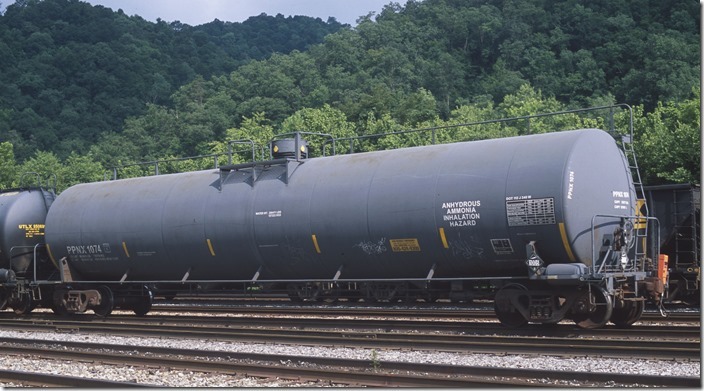 Ethanol trains run several times a week. 1. 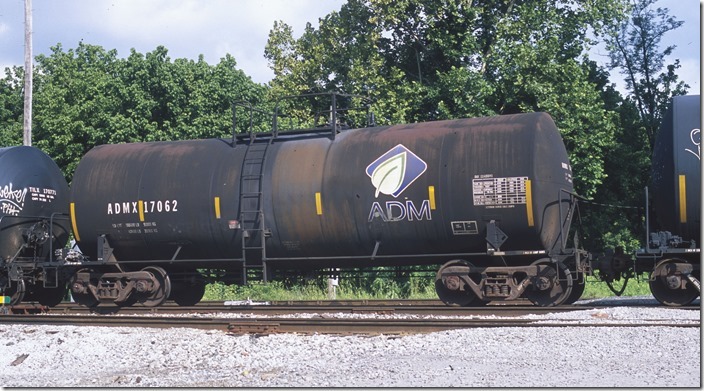 ADMX (Archer-Daniels Midland) 17062 was on a unit train of corn syrup arriving Shelby. 07-21-2013. 2. DMIX (Minnesota Corn Processors) 191158 was built 05-1998. 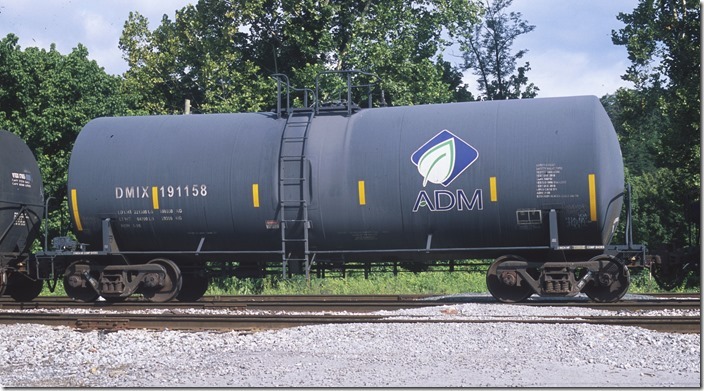 ADM logo. 3. DMIX 190511 was built 03-1996. MCP logo. 4. SYRX (Minn. Corn Processors) 200282 was built 06-1994. 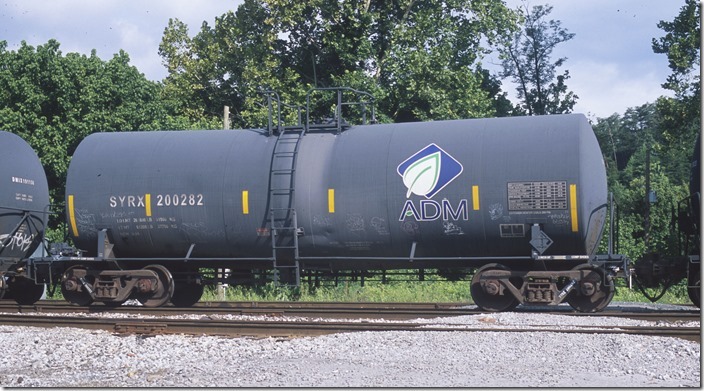 ADM logo. 5. 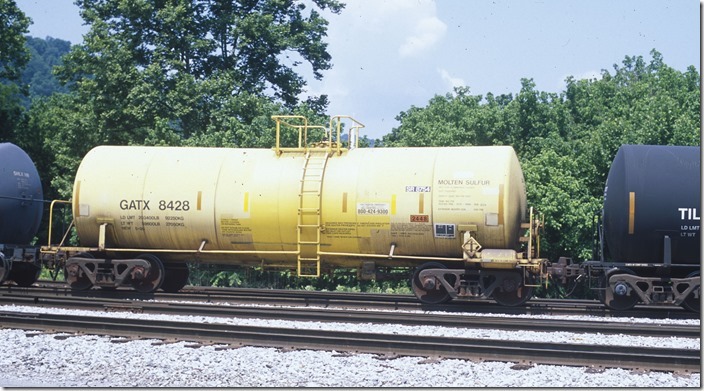 VTGX (VTG Rail Inc.) 17009. 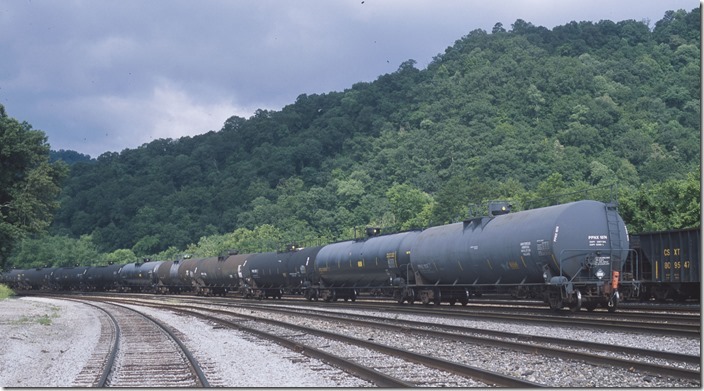 VTG is a rail car leasing company. 6. 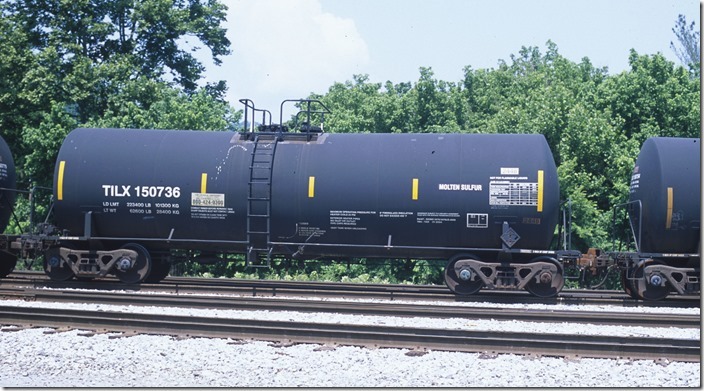 CSX K616-17 e/b pulls into Shelby with 63 cars of corn syrup for a crew change. There was a real variety of rolling stock! 07-21-2013. 7. 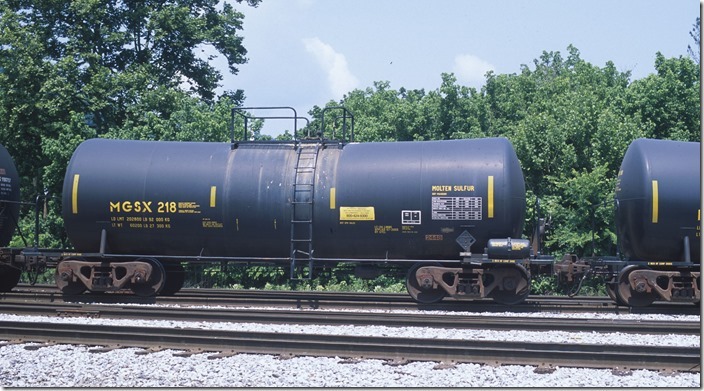 PPNX (PCS Phosphate Co.) 1074 was built 12-1997. The placard is for non-flammable compressed gas. 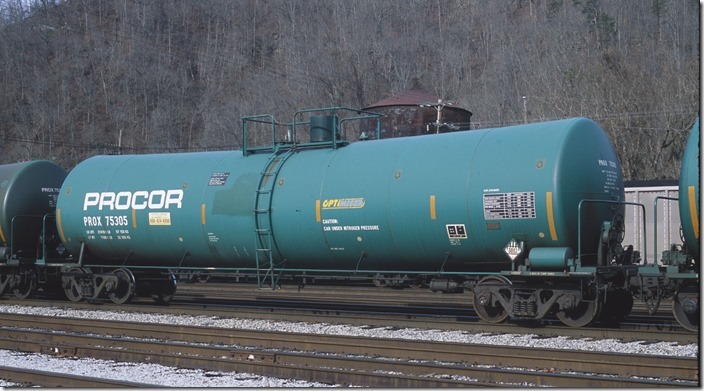 The contents say anhydrous ammonia. 8. 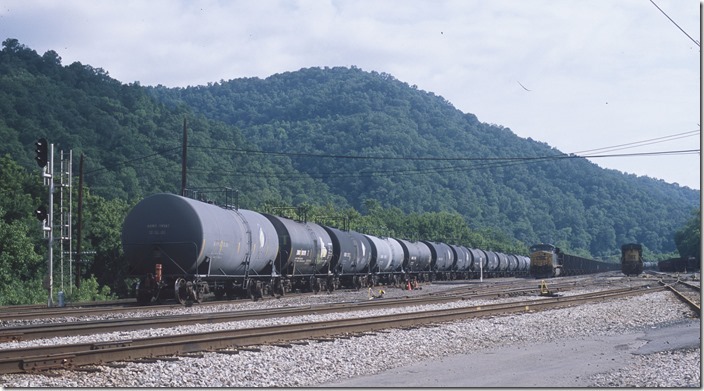 A shifter crew took this train to Paintsville, so I didn’t get a designation. 07-21-2013. 9. 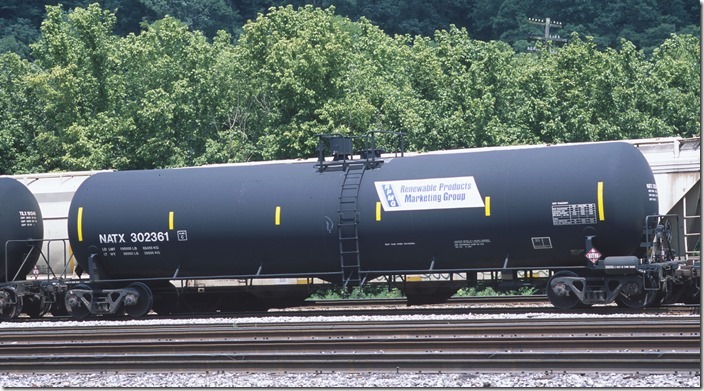 TILX (Trinity Industries Leasing) 198550 is on an ethanol train. 07-22-2012. 10. 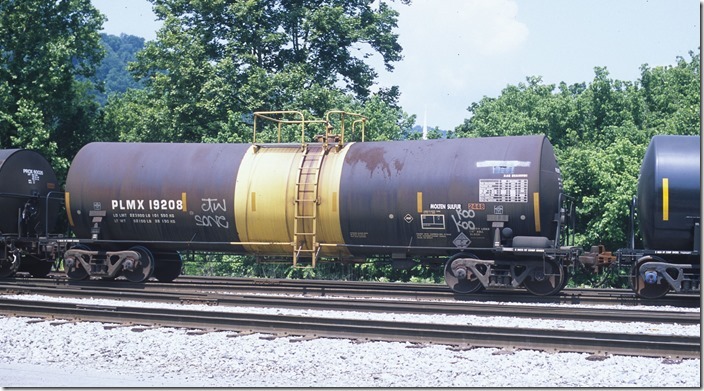 NATX General Electric Rail Services Co., North American Tank Lines) 302361 at Shelby on 07-22-2012. 11. 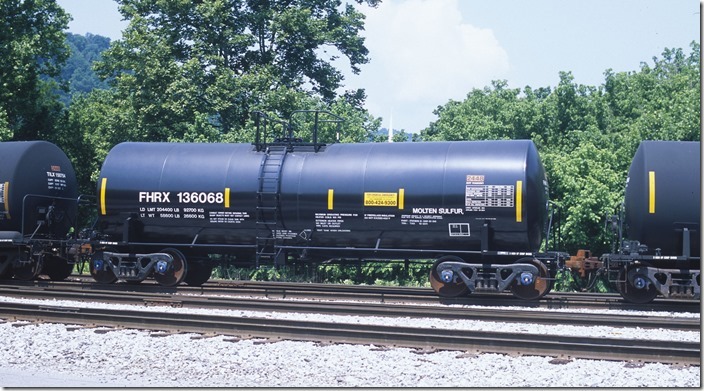 TILX (Trinity Rail Car Leasing) 150736 was built 01-2004. Arriving Shelby on a molten sulfur train on 05-26-2012. What a variety of cars! 12. 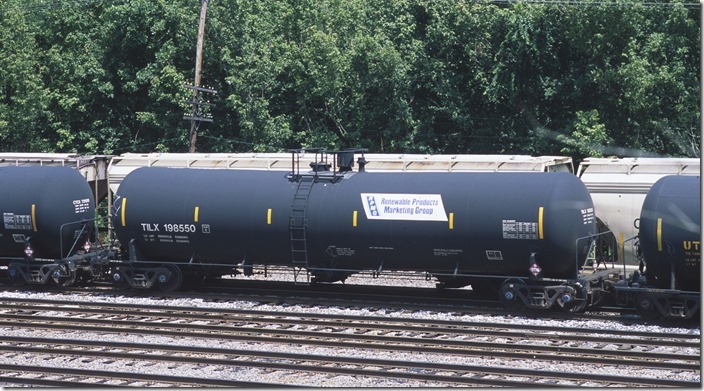 FHRX (Koch Rail LLC, Flint Hills Resources LP) 136068 was built 10-2011. 13. PLMX (CIT Group, PLM, Professional Leasing Management) 19208 was built 02-2004. Regarding that “ARI” logo, I’m not sure if that’s the builder or what. 14. GATX (General American Marks) 8428 was built 05-1999. 15. 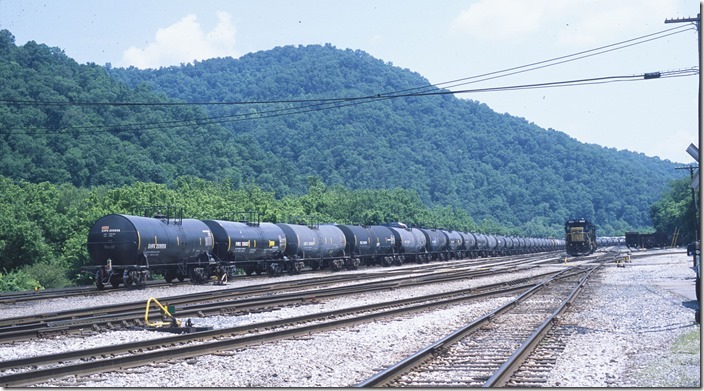 MGSX (Martin Operating Partnership LP, C. F. Martin Sulfur LP, Martin Midstream Partners) 218. 16. 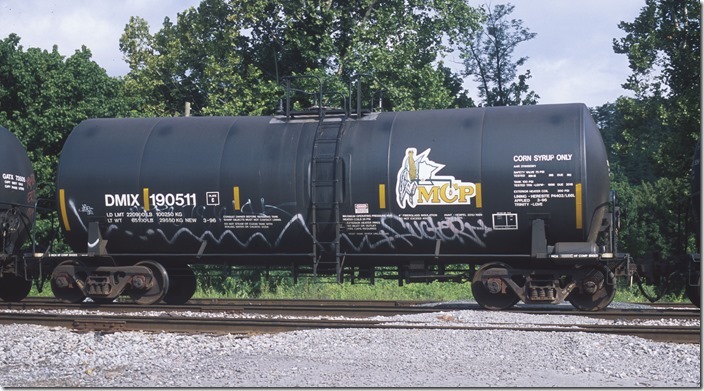 SHPX (American Railcar Leasing, ACF Industries, Shippers Car Line Division) 209956 brings up the rear of this molten sulfur train as it arrives Shelby on 05-26-2012. 17. 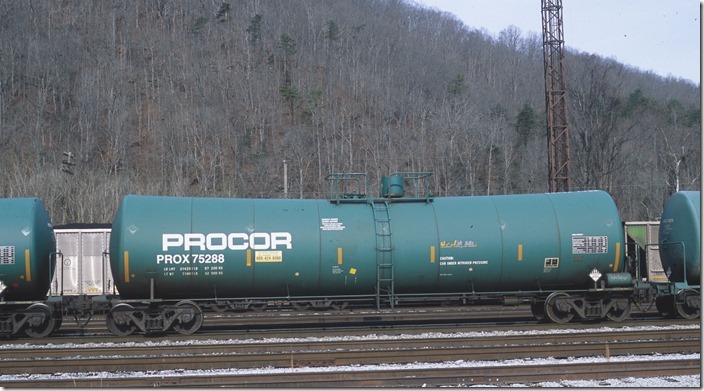 PROX (Procor Ltd.) 75288 was built 02-2000. At Shelby on w/b Q697 on 12-28-2013. Sway-back design! 18. PROX 75236 was built 12-1999. 19. 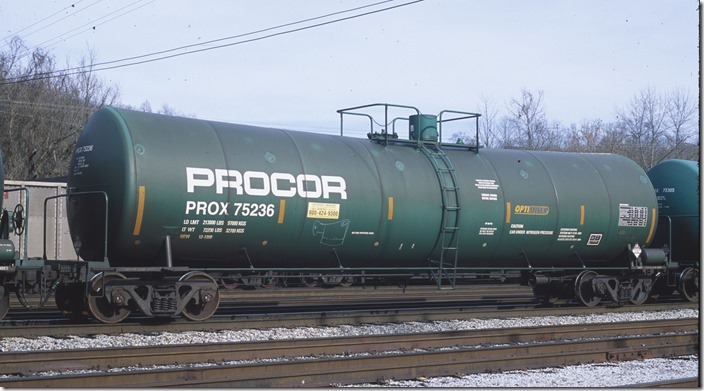 PROX 75305 was built 02-2000. 20. 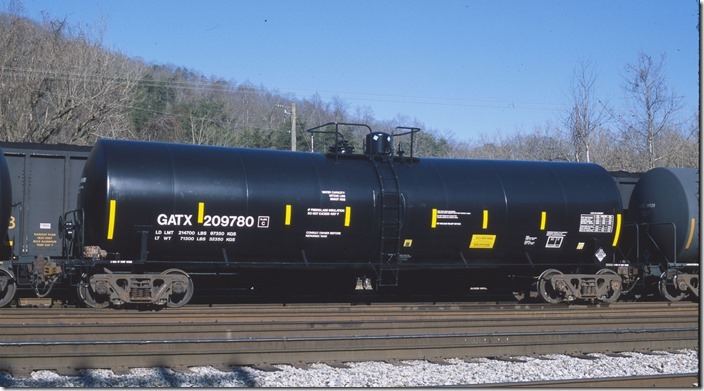 GATX (General American Marks Co., GATX Corp., General American Tank Line) 209780 was built 10-1999. Shelby on 01-01-2014. You can look these companies up on-line and see just what they are in to.